There are six major regions of whisky production in Scotland and each region has it’s own general characteristics. Of course, there are exceptions to every rule but here I will explain these basic regional characteristics and this may help you to select which style of whisky will suit your taste. Within each region, each distillery also has it’s own individual characteristics and this diversity gives us the different styles of the same drink and is what makes the world of whisky so interesting. There are currently over 80 distilleries in operation throughout Scotland. The Lowlands was once a major area of production but fell on hard times in the 1980s and early 1990s. Currently there are only three operating distilleries – Glenkinchie, Auchentoshan and Bladnoch (which was closed in 1993 and reopened in 2000). ‘The Highland line’ runs to the north of Glasgow and Edinburgh and this imaginary line is the boundary between the Lowlands and the Highlands whisky regions. The style of whisky produced in the Lowlands is light, fresh and fruity and are regarded as very easy to drink. They are subtle and refreshing, good for hot weather and as an introduction to whisky for someone who has not tasted it before. The Highlands is the largest region and contains some of Scotland’s remotest distilleries. The distilleries are spread far and wide and include Glengoyne that is very close to ‘the Highland line’, Oban on the west coast, Dalwhinnie in the middle of the Grampians and Old Pulteney up in the far north. There is a large diversity of styles due to the geographical locations but generally the whiskies produced are richer, sweeter and more full bodied than from anywhere else in Scotland. Distilleries that are located by the coast can also have a salty element to their whiskies, due to the casks breathing in the sea air during maturation. 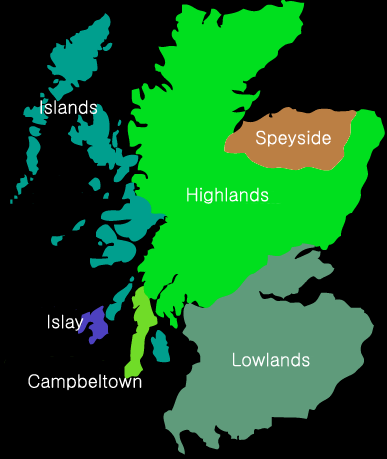 It is within this region that there is the largest concerntration of distilleries in Scotland. There are currently over 30 in operation within what is a relatively small area, based around the towns of Elgin, Rothes, Dufftown, Keith and the surrounding glens. This has historically always been the case and is due to the combination of perfect climate for whisky maturation, quality water supply and locality to the quality barley growing areas. The whiskies produced include some of the most famous in the world, such as Glenfiddich, Macallan and Glenlivet, but also a number of hidden gems. The style is generally reasonably light with pronounced malty flavours and some sweetness. Speyside whiskies sit somewhere between the light Lowland whiskies and the richer, sweeter Highland whiskies. This is what makes them so popular. Campbeltown is found on a peninsula on the west Highland coast. It was once home to 15 distilleries but the industry there fell on hard times, partly due to the remoteness of it’s location and the resulting problems in transportation. Now there are currently only three operating distilleries in Campbeltown – Springbank, Glen Scotia and Glengyle (which has only just reopened in 2004, having been closed way back in 1925). They all use peated malt and the resulting whiskies have a light smoky flavour mixed with some maltiness and sweetness. They would be good examples to give to someone who was wanting to try a smoky whisky but not something too heavy or overpowering. There are a number of distilleries that are based on the islands around the Scottish coast. These are Arran (on the isle of Arran unsurprisingly! ), Jura (on the isle of Jura! ), Tobermory (on Mull), Talisker (on Skye) and Highland Park and Scapa (on the Orkneys). There is no distinct style and all are pretty unique due to their locations. Generally, Arran and Scapa are the lighter and fresher whiskies, Jura and Tobermory are richer, sweeter and maltier while Talisker and Highland Park offer full bodied whiskies with some smokiness. The island of Islay is the traditional home of smoky whiskies. Six of the eight operating distilleries produce the best smoky whiskies in the world and include some very famous names (the six are Ardbeg, Bowmore, Caol Ila, Kilchoman, Lagavulin and Laphroaig). The other two are Bruichladdich and Bunnahabhain, whose whiskies are normally unpeated and non smoky, but they do both occassionally produce limited edition smoky ones. The Islay whisky industry is booming and production on the island is at an all time high to meet demand. The industry runs the island’s economy by giving jobs not just in manufacturing but in other areas, such as tourism. The whiskies are full bodied, smoky and complex. However, they are not to everyone’s taste as they are so full on but are definitely worth a try. How will you know if you like it (or don’t like it) if you don’t try some?